The executive summary of this article could read something like this. Accurate housing or other fact checks are useful. Pulling back the curtain on popular reports, to see what’s not stated, can be beneficial too. When affordable housing shoppers hear about reports like the ones posted or linked below, its wise to step back to look anew at what the evidence says. The Australian version of 60 Minutes did a pair of segments posted below of people there who invested in high-rise housing that has turned out to be problematic, perhaps seriously dangerous. Some have lost large sums of money; others may have lost their entire investment. That same video news magazine did a related report, more closely tied to the single family side of their growing crisis. That video is posted below. There are numerous possible takeaways from these two reports. From the first video is their notice about a lack of consumer protection for buyers of those high-rises. One expert said there are more consumer safeguards for buying a toaster in Australia than for buying high-cost high-rise housing. So just because a structure was assembled on site or is more expensive doesn’t automatically mean that it a better value than an American made manufactured home. But let’s take a side step before we go there. Before proceeding, if you are one of the millions who watched the John Oliver video that ripped unethical behavior in the manufactured home industry, please see the report linked below. The bad or questionable behavior of the few in the manufactured home industry should not be grounds to condemn a much needed and proven affordable housing solution. You can access our popular fact-check and response report on Oliver’s viral report – and see that HBO video, if you haven’t already – by clicking the linked text-image box below. Properly understood, both Oliver’s viral video – misnamed “mobile homes” – and the Australians’ painful facts – coincidentally – teach a surprisingly similar lesson. It’s the following. Here in the U.S., there are several means to correct what’s wrong. Certainly, news media can be used for good or for ill. You don’t have to ponder long to recall examples of what amounted to misleading or ‘fake’ news promoted by this or that news outlet. But some problematic reports don’t mean that all news reports are bad. Nor does a lot of good and useful reports guarantee that some don’t have flaws. We strongly believe on MHLivingNews and on our professional sister-site, MHProNews, in a ‘wheat and chaff’ approach to life, people, products, parties, organizations, companies, etc. You can find good or bad almost anywhere, with anyone, or on anything you look. But beyond news, are consumer protections that buyers of a new manufactured home enjoy. Those Australian high rises are an example of costly housing that in the cited cases proved to be dangerous. By contrast, the failsafe’s built into the construction of manufactured homes doesn’t mean they are perfect. They are not. But the odds of having a problem like the Australian one are a tiny fraction of a single percentage point here in the U.S.. That is a proven fact, based upon federal data. In fact, we are not aware of any incident with a new manufactured home that remotely resembles that kinds of problems described in those costly high-rise housing. The problems reported are more modest and are routinely corrected. Why is that so? 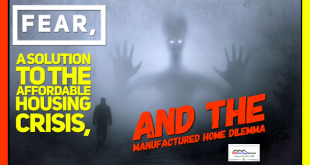 The reason is that the most proven permanent affordable housing system in America, manufactured homes, has so many cross-checks that even a large and complex system like a house can be produced efficiently, safely, and for a reasonable cost. Fact: manufactured homes today are typically far more closely inspected than their conventional on-site constructed housing counterparts. In the first 60 Minutes Australia video above, the statement is made that there are more consumer protections there for buying a toaster that buying that housing. They are not alone. The report linked below from here in the U.S. focused on cases where people spent hundreds of thousands of dollars on conventional housing made a similar point. ICYMI, you can access that report later by click the hot-linked text-image box below. At MHLivingNews we believe a wise consumer must do their homework about a company that they are considering doing business with. 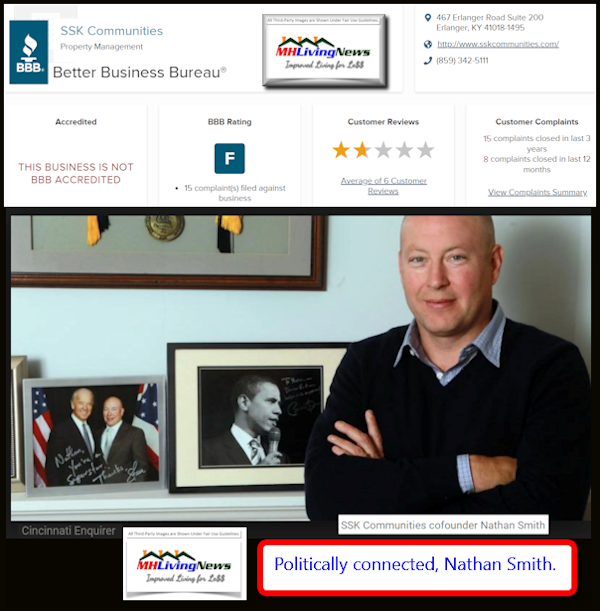 We’ve used the example before of SSK Communities, its partner is politically connected, and was one of the firms understandably ripped by Oliver’s video. SSK has had an “F” rating with the Better Business Bureau (BBB) for some time (click here to see that F rating). By doing some online research, you could have checked them or a similar company off your list. A new manufactured home comes with a warranty, much like that toaster purchased in Australia, Canada, or in the U.S. If there is a covered problem, there are warranty and dispute resolution systems in place to correct the manufactured home. What is and isn’t covered under warranty must be clearly understood. The least expensive manufactured homes – not unlike the least expensive car, boat, or RV – are not as fancy as the most expensive one. That least expensive manufactured home has a warranty like the most expensive ones do. That warranty may not cover ‘finish’ or appearance concerns, but does cover construction, safety, assures the energy standards, and the like. Thus, on even a low-cost new manufactured home – if, for example, a window on a new home leaks – it’s covered under warranty. 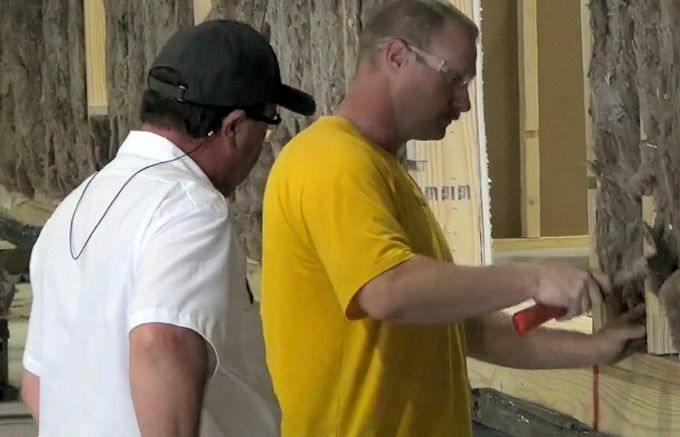 By contrast, if a batten strip on an entry-level manufactured home is imperfect, some may tell you to get out the hammer and nails and fix it if it bugs you. The leaky window on a new home? Warrantied. The bowed batten strip? That’s cosmetic, and unless the seller goes above and beyond (some do, others not), it is what it is. Entry level “shade and shelter” manufactured homes feature VOG and batten strips vs. finished drywall as you’ll see in modular homes or residential style manufactured homes. 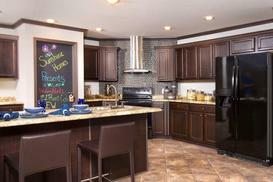 Residential style manufactured homes look much the same as conventional or modular homes. But on that lower cost manufactured home, someone can buy that home for a small fraction of the price of most conventional housing. It’s a tradeoff; a decision a prudent buyer should make before buying. Those ‘shade and shelter’ or entry level-homes often have less costly monthly payments to buy a manufactured home, than someone may pay in rent for a conventional house. The same is true for conventional housing payments vs. manufactured home payments. The following graphic on the left is from the report linked here. But look too at the payment graphic further below. There are cheaper-sound systems, cell phones, or TVs and then there are fancier ones. 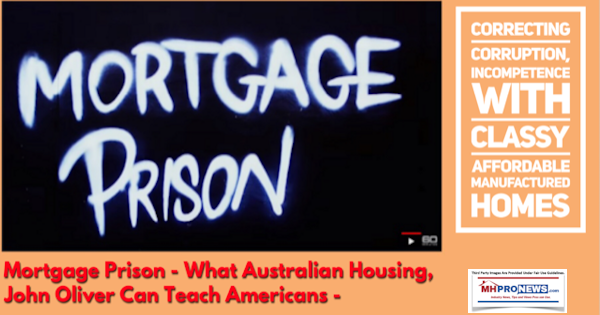 While you don’t always get what you pay for – think about those Australians, and those problematic high-rise housing units – you can and routinely do get what you pay for with a HUD Code manufactured home. Know the details before you sign. Ask questions. Get what is promised reduced to writing that both the seller and you sign off on. Manufactured homes are inspected by the factory typically several times before it is shipped to its final destination. It has to be strong enough to endure the stress of going down a highway at interstate speeds. What conventional housing can claim that? Also, HUD Code manufactured homes are also third-party inspected under the authority of the federal government. Why aren’t conventional housing? Properly understood, while not perfect, the value of modern manufactured homes is amazing. The system here in the U.S. delivers such a high degree of construction standards that only a few dozen cases a year go to dispute resolution for every new 100,000 homes build. That’s important and impressive. Graphic credit, Fannie Mae study. Arrow and commentary, MHLivingNews. Shop wisely. If you don’t feel comfortable with a specific sales professional, but do feel good about the company, ask management for another representative to work with. The bottom line ought to be this. 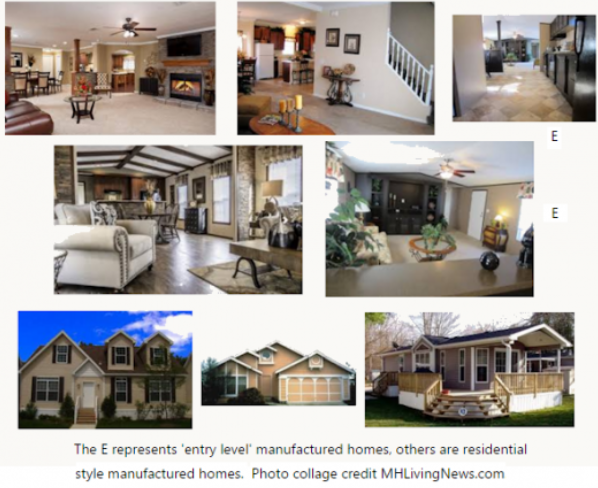 Manufactured homes are proven here in the U.S. They are federally regulated. In 2018 alone, there were numerous third-party reports that made the point that much of what people mistakenly believe is either outdated or wrong. Why is there so little proper understanding of manufactured homes? At a minimum, aren’t the problematic companies and trade association that John Oliver’s video ripped in part to blame? The challenge is to not throw the baby out with the bath water. 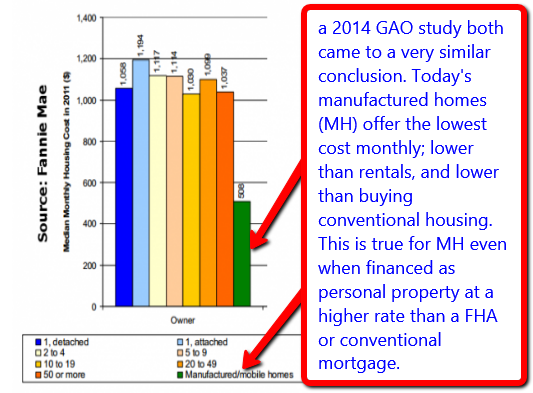 Manufactured homes are a proven good. A new manufactured home demonstrably has more consumer safeguard than conventional ‘site building,’ as the Australian experiences noted above documents. If there is an economic downturn, yes, a manufactured home can have its value impacted just as conventional housing does. But the difference is that there is less invested to begin with. No bet is 100 percent safe, and no form of housing is perfect. But manufactured homes are a good value that should not be disparaged because of the bad actions of a few, no matter how big they may be. The folks in Knoxville or connected to the Arlington, VA based trade group linked here are arguably either incompetent, corrupt, and/or have a hidden agenda. It is wrong to allow people to have a twisted view of modern manufactured homes. “He who passively accepts evil is as much involved in it as he who helps to perpetrate it. He who accepts evil without protesting against it is really cooperating with it.” – Martin Luther King, Jr.
Soheyla Kovach (pronounced “SoHeyLa” and “CoVatch” like a Watch with a V), left. Tamas (pronounced TahMash) Kovach, center. L. A. “Tony” Kovach, right. Photo by 83 Degrees media, see their story on our operation at this link here. with son Tamas (pronounced like Tah Mash), and publisher L. A. ‘Tony’ Kovach, on the right. Clicking on text-image graphics will take you to that report. Next Manufactured Housing – Greener Savings by Design – Earth Day Opportunities Missed?